I first sat down in a Prague restaurant in 1995. I've been in countless eateries here since then. I've seen them come, and I've seen them go. One that's been around since well before I arrived and is still going strong is V Zátiší. Opened in 1991, the website claims it was one of the first private restaurants in the city. Over the years, I've enjoyed V Zátiší's food at The Prague Food Festival, but for some inexplicable reason, I'd never been under their roof. Until last week. The restaurant occupies a prominent corner off Betlémské náměstí in Old Town. I was taken to the dining room on the left of the entrance and offered a table. Although attractive, only three tables were occupied, and I found the room too quiet. 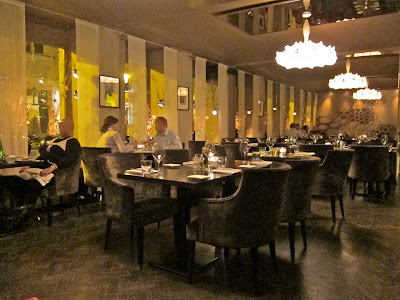 I asked for a different table and was take to the other dining room, which had more light and energy. Tables began to fill with customers. This was more to my liking, though there was a big party in a separate room that occasionally exploded loudly with laughter. 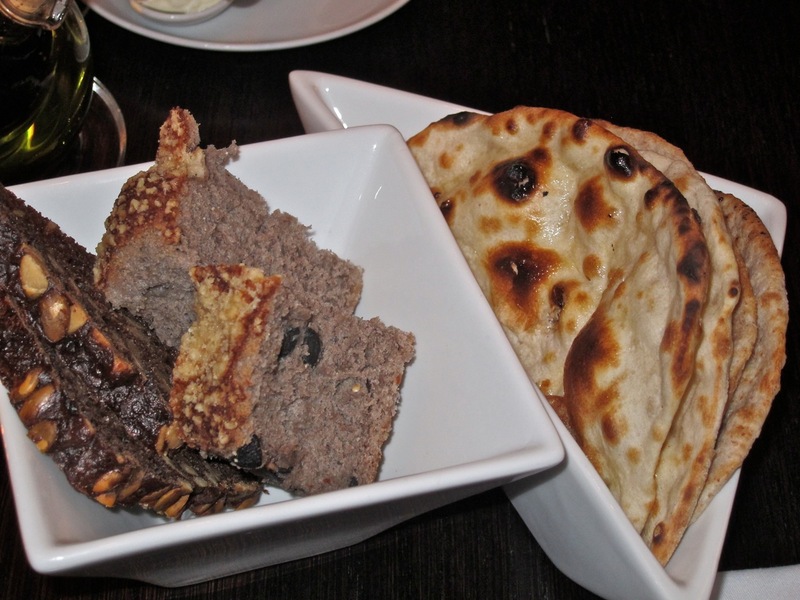 The waiter brought a selection of breads that included naan. It was warm, but dry. On the side, I poured olive oil with a touch of balsamic. I tried it with the naan for a little impromptu Asian-Italian fusion. There were no other dips or spreads. 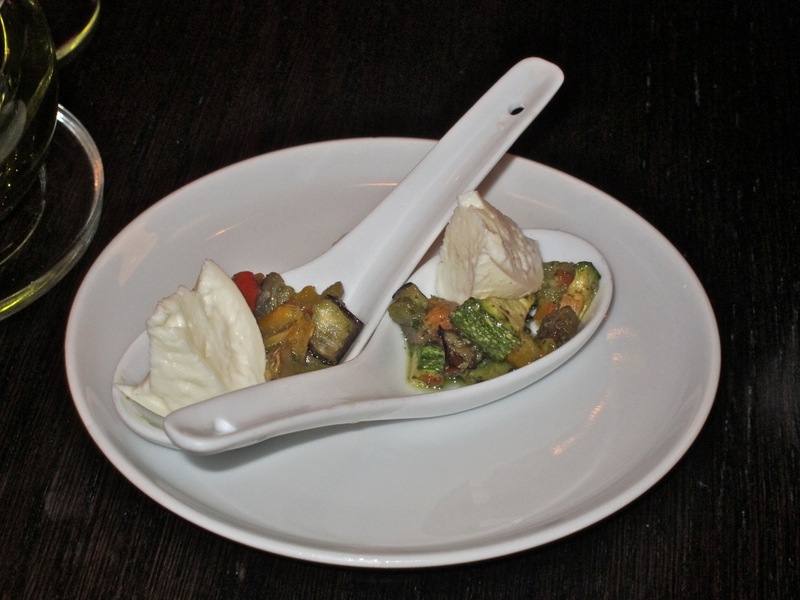 My friend and I received an amuse bouche from the kitchen: small spoons holding a dollop of fresh mozzarella and marinated, grilled vegetables. It was a nice bite, but nothing too memorable. Since this dinner marked an important milestone, we decided to pull out the stops and get the three course menu with wine pairings. There are a number of Indian dishes on the menu. 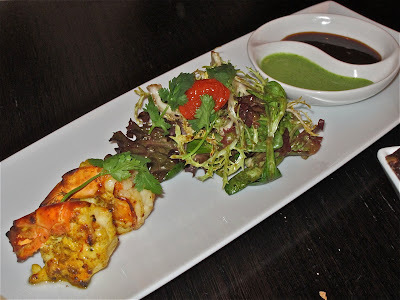 My friend started with the mustard tandoori tiger prawns with mint-coriander chutney. The prawns were rubbed with savory Indian spices but gained only a little flavor from the oven. But they did spend too much time in there. They grew tough. The prawns were medium to large in size, but it felt ungenerous to only get two. It would hardly break the bank to serve three. The salad in the middle was small. The mint-coriander sauce was assertive, with a tart tinge, and very enjoyable. The wine for this dish was a German Riesling, which complemented it well. 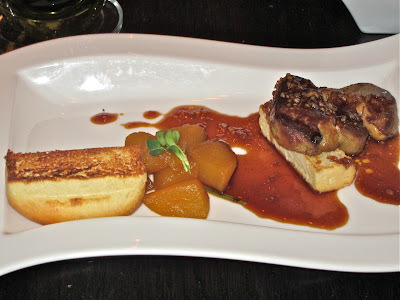 I had the sautéed tranche of French foie gras with pear confit and brioche. I again will incur the wrath of the anti-foie gras set, but c'est la vie. The goose liver was excellent: warm, delicate, smooth and creamy. I mopped up all the sauce underneath. The pear added a simple sweet note and not much more. The brioche disappointed me. I've had some good ones in this town, especially the one served at Cafe Bar Bresto. The brioche at V Zátiší was dried out and reminded me of a crumbling American hot dog roll. I'm not trying to be mean. I'm just being honest about what popped into my head after I popped it into my mouth. The paired wine was a syrupy, sweet French Sauternes. This is considered a classic companion for foie gras. And yet, I found it too heavy and cloying for a first course. I'll swim against the tide of popular and professional opinion on this one. For the main course, I had the veal fillet with red wine and creamy veal sauces. The small slices of super tender tenderloin had great flavor by themselves. They didn't need sauce, but I'd recommend not passing these up. They were fantastic. The sweetish red wine sauce was decadently delicious. 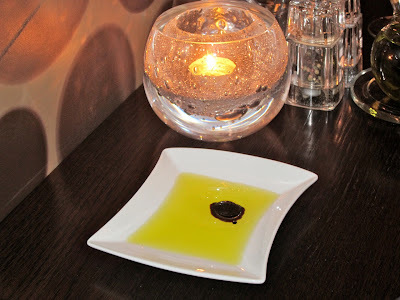 It glazed my palate with the flavors of beef drippings and wine and and reminded me of the best demiglaces I've had. The saltier veal sauce came in second place, but was still very good. The flavor reminded me vaguely of beefy caramel. In a good way. 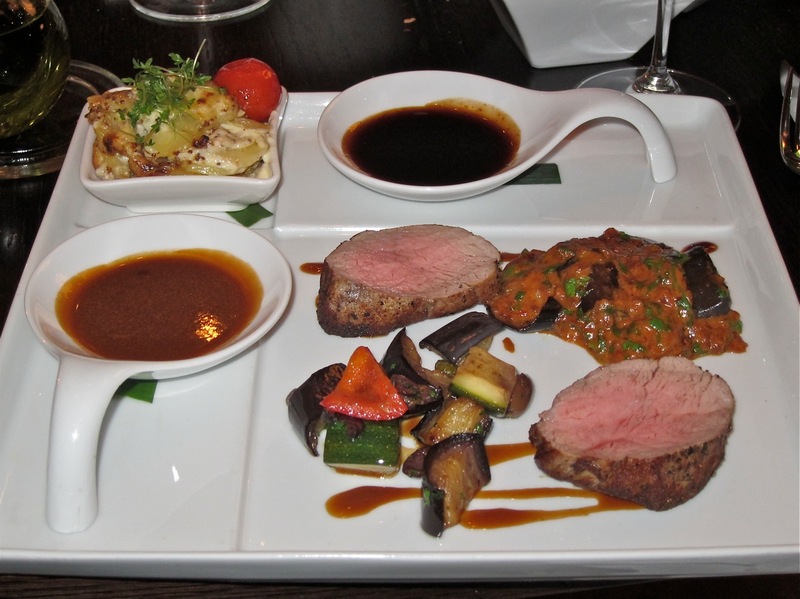 The veal was accompanied by a small amount of tasty grilled vegetables and a lovely ratatouille-like tomato and eggplant mix. I also liked the creamy, freshly prepared potatoes with whole grain mustard. My friend had fillet of sea bass, with a citrus-rosemary sauce and crémant velouté. The fish was fresh, with a crispy exterior. The surface was on the dry side, but it was moist and flaky underneath. It sat on lightly crunchy wilted bok choy. Rather dull ratte potatoes had their own little bowl. 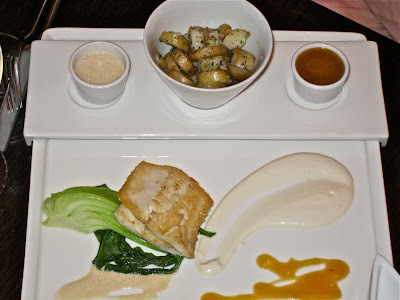 The buttery sauce next to the fish tasted of cauliflower and went well with it. With my veal, I was given a 2008 Saint Clair Pinot Noir from New Zealand. I found it simple and dry. It was decent and drinkable, but nothing exciting. Much better was my friend's dry Chablis. That glass brought a small smile. To end the meal, I ordered the dessert sampler. 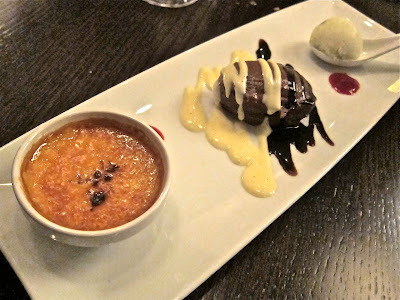 It consisted of a crème brûlée, a chocolate mousse, and lemon sorbet. The cream in the petite bowl was creamy goodness, but perhaps too much heat was applied to the top. The caramelized sugar was unusually thick. The intense chocolate was thicker than most mousses I've had, but I loved it. The not-too-sweet sorbet was more ordinary and could have used more citrus zing as a palate cleanser. 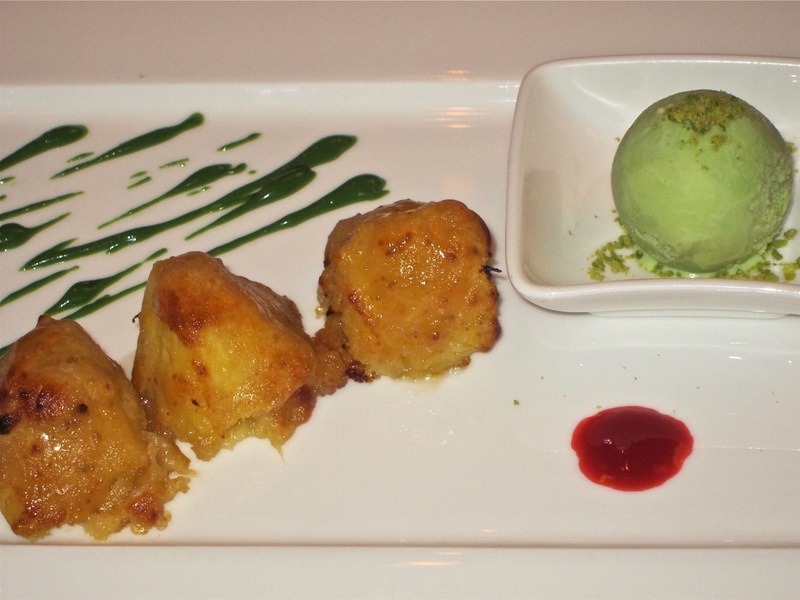 My friend had the tandoor-baked pineapple with pistachio ice cream. We imagined something more exotic than it was. It was basically baked fresh pineapple with a hint of flavor from the oven. Although unnaturally green, the ice cream was nutty and nice. Intensely green marzipan-flavored syrup was drizzled on the plate. We mostly avoided that. The dessert wine for both of us was the 2009 Sonberk Pálava. 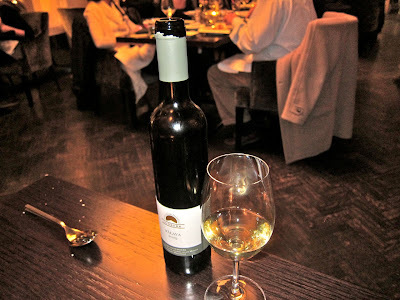 Less sweet than the Sauternes and with a light, sour note, the southern Moravian wine had a delicate balance and flavor that we both thought a fitting friend for the final course. 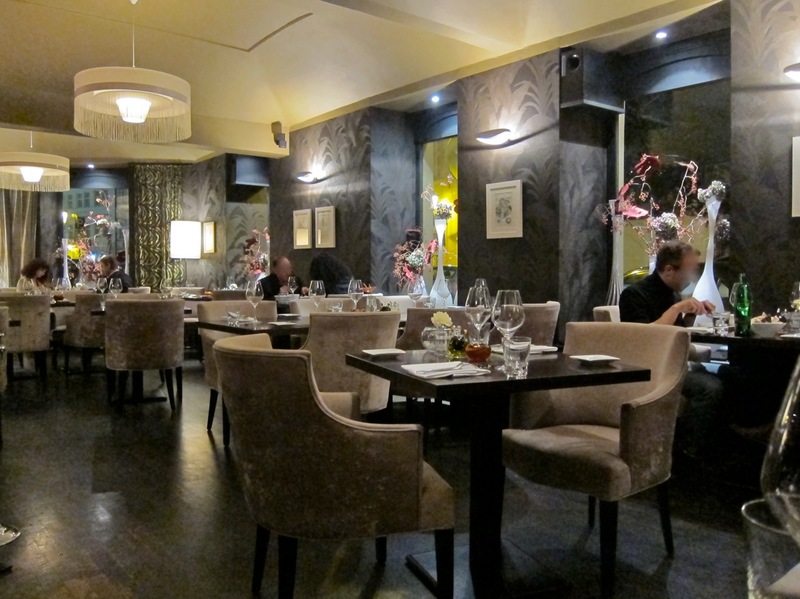 Though the restaurant was relatively busy for a Monday, service was generally good. 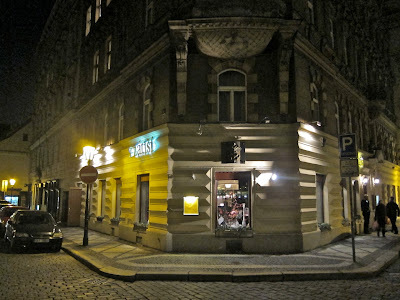 V Zátiší's menu is designed in such a way that you can pick two courses for 890 CZK, three courses for 1050 CZK, and each extra course is 150 CZK. There are no prices for individual dishes. The wine pairing for two courses is 490 CZK and for three courses, it is 590 CZK. This pricing system assumes that all dishes having equal cost and value. Frankly, I find it restrictive and annoying. The big question is: How much did this dinner for two cost? 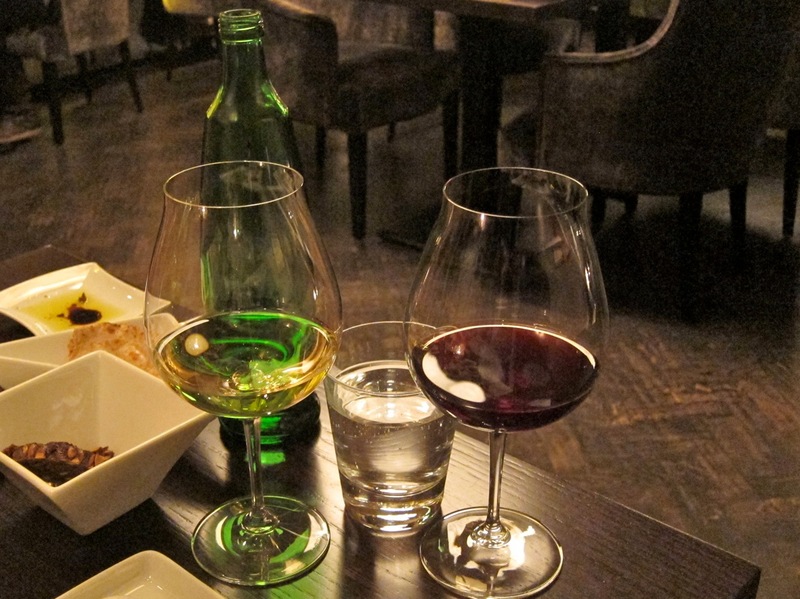 The three courses for two people with the wine pairings, plus a bottle of mineral water, came to 3375 CZK before tip. I haven't spent that much on a dinner in a long, long time (not counting the recent dinner a friend bought me at Chateau Mcely). I generally liked the food, but it wasn't flawless. The relatively small portions, as with the veal and prawns, is somewhat masked by the creative arrangements on the big designer plates. The cooking was good, but not that precious. It was fun to have a variety wines through the meal, but I was not overly impressed with them, either. I think a restaurant like Chagall's Club, one of last year's favorites, is a better deal. There, you could have a top-notch three-course dinner with a moderately priced bottle of wine for around 2500 CZK. They also have an eight-course degustation menu for 1100 CZK per person. Perhaps V Zátiší was a better value in the past. At present, with these prices, I don't see this famous old restaurant in my future.